By now, Lady Romney's serene indifference to the world of –- oh, just about anybody who doesn't do horse ballet — has reached legendary status. On her privileged planet, income inequality is a noble thing and you get through college on your man's stock portfolio. For a tour of her best foot-in-mouth musings, we've assembled a list of items filed under, "Wow. She really said that!" "We can be poor in spirit, and I don't even consider myself wealthy, which is an interesting thing," said Ann Romney to Fox News. "It can be here today and gone tomorrow." Hmm. Interesting indeed, considering that her husband is worth about $200 million. If elected, he would be among the richest presidents ever to occupy the White House, topping both the Roosevelts and the Bushes, who were no slouches. In fact, he's wealthier than the last eight presidents combined. 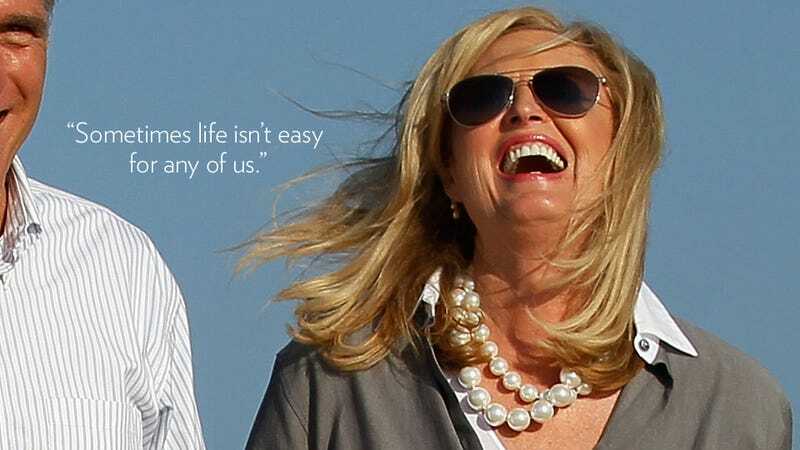 Ann Romney's favorite fancy dressage horse, Rafalca, costs more to feed and shelter than your whole family. How wealthy does that make you feel? Back in April, Ann Romney spoke to the Connecticut Republican Party's Prescott Bush Awards Dinner in Stamford, where she waxed personal on the rigors of raising kids while Mitt was off destroying jobs. Mrs. Romney said she likes to see what women are up to on the campaign trail, asking "Why are you here? What made you come out of your house today to this event? And what do you think about the future?" Not all women have the luxury of staying at home, she conceded: "I love the fact that there are women out there who don't have a choice and they must go to work and they still have to raise the kids. Thank goodness that we value those people too. And sometimes life isn't easy for any of us." If you're one those people, you can wrap yourself in Ann Romney love while you ponder why her horse gets a $77,000 tax credit when your kid gets $1,000. When newlyweds Ann and Mitt Romney were living together while attending Brigham Young, things were pretty swell. "We were happy, studying hard," Romney said in an infamous Boston Globe interview back in 1994 , when Mittens was running for the senate. "Neither one of us had a job, because Mitt had enough of an investment from stock that we could sell off a little at a time," she explained. How awesome is that?!? The stock came courtesy of Mitt's papa, who had invested Mitt's "birthday money" every year. Ann looks back fondly on this time as a period when she and Mitt were really roughing it. For realz. In an interview with a Baltimore radio station, Ann Romney pressed the audience to believe that despite her husband's stiff demeanor and penchant for human and canine bullying, Mitt was really full of chuckles. She opined that "we better unzip him and let the real Mitt Romney out." Stiff or not stiff? We're not sure we want to unzip Mr. Romney to find out. You people. You're always asking annoying questions and daring to insinuate that there's something wrong with all those Romney tax havens and offshore accounts. Why don't you stick to clipping coupons or whatever it is you people do to stay busy? In an interview with ABC's Good Morning America that quickly went viral, Mrs. Romney got huffy when asked why American voters would not be vouchsafed a look at Mitt's latest tax returns. "We've given all you people need to know," she sniffed. Yes, Ann. And you Romneys have given us little people all we need to know!